November 2, 6:30 pm. to 8:00 p.m.
Islamophobia is increasingly rising to the front of national attention. Establishing trust and building relationships among people of different faiths and cultures is a priority for Minneapolis Council Members Warsame and Frey. In a time when Islam is the subject of much discussion and controversy, Warsame and Frey hope to enable an ongoing open dialogue, in a safe environment for debate, and promote a more informed understanding of Muslim culture. 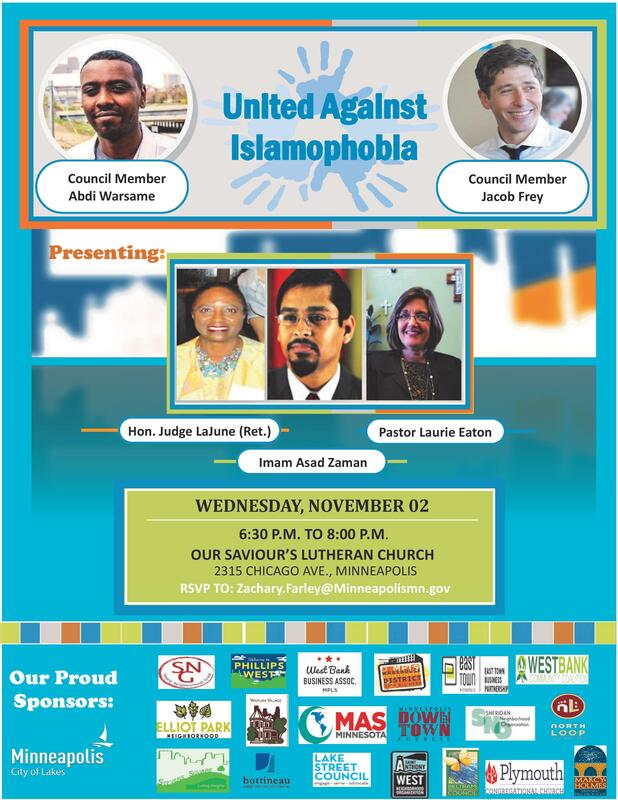 They want to extend an invitation to all community members to attend to this panel on November 02 at 6:30 pm at the Our Saviour’s Lutheran Church. Lange is a senior fellow with the Roy Wilkins Center for Human Relations and Social Justice. A retired State of Minnesota trial court judge, Lange is an expert on legal and constitutional standards for discrimination in state and federal courts. Pastor Eaton was called as pastor to Our Saviour’s Lutheran Church in Minneapolis in 2009. She is an active leader in ISAIAH, a coalition of approximately 100 congregations committed to living out faith values in the public realm, seeking racial and economic equity in our state. Imam Asad Zaman is a distinguished leader in the education and non-profit sectors. He is the Executive Director of the Muslim American Society of Minnesota and a frequent speaker at Islamic conferences and Islam Awareness Weeks.